I recently talked about reading The 5 Love Languages for Children and how interesting I found it. 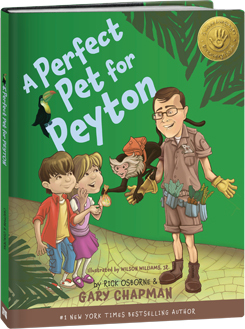 The Perfect Pet for Peyton is a wonderful children’s book that works hand in hand with the other one. In this book two twins, Penny & Peyton, set out to find the “perfect pet pals” on their birthday. Along the way they learn a little more about themselves–and their friends–by the pets that are chosen that match their love languages perfectly. This book would be great for young school age children. Amber absolutely *adores* it and we’ve been reading it over and over and OVER for bedtime each night. It’s a little on the longer side–but the amazing sounding pet emporium and all the different animals keep her entranced! Even though she’s a bit young to grasp the concept of love languages it’s still great for her to be learning the different ways we have to show people that we love them! Next Next post: Business Cards ~ Not Just for Business anymore!